Introduction: Different techniques of radiation therapy have been studied to reduce the cardiac dose in left breast cancer. Aim: In this prospective dosimetric study, the doses to heart as well as other organs at risk (OAR) were compared between free-breathing (FB) and deep inspiratory breath hold (DIBH) techniques in intensity modulated radiotherapy (IMRT) and opposed-tangent three-dimensional radiotherapy (3DCRT) plans. Materials and Methods: Fifteen patients with left-sided breast cancer underwent computed tomography simulation and images were obtained in both FB and DIBH. Radiotherapy plans were generated with 3DCRT and IMRT techniques in FB and DIBH images in each patient. Target coverage, conformity index, homogeneity index , and mean dose to heart (Heart Dmean), left lung, left anterior descending artery (LAD) and right breast were compared between the four plans using the Wilcoxon signed rank test. Results: Target coverage was adequate with both 3DCRT and IMRT plans, but IMRT plans showed better conformity and homogeneity. A statistically significant dose reduction of all OARs was found with DIBH. 3DCRTDIBHdecreased the Heart Dmeanby 53.5% (7.1 vs. 3.3 Gy) and mean dose to LAD by 28% compared to 3DCRTFB. IMRT further lowered mean LAD dose by 18%. Heart Dmeanwas lower with 3DCRTDIBHover IMRTDIBH (3.3 vs. 10.2 Gy). Mean dose to the contralateral breast was also lower with 3DCRT over IMRT (0.32 vs. 3.35 Gy). Mean dose and the V20of ipsilateral lung were lower with 3DCRTDIBHover IMRTDIBH (13.78 vs. 18.9 Gy) and (25.16 vs. 32.95%), respectively. Conclusions: 3DCRTDIBHprovided excellent dosimetric results in patients with left-sided breast cancer without the need for IMRT. External beam radiation therapy (EBRT) for breast cancer is usually delivered using parallel-opposed lateral and medial tangential portals. The treatment volume with tangential fields includes a significant volume of heart and left anterior descending artery (LAD) resulting in radiation-induced late cardiac effects. The probability of cardiotoxicity is further amplified by the systemic chemotherapy. 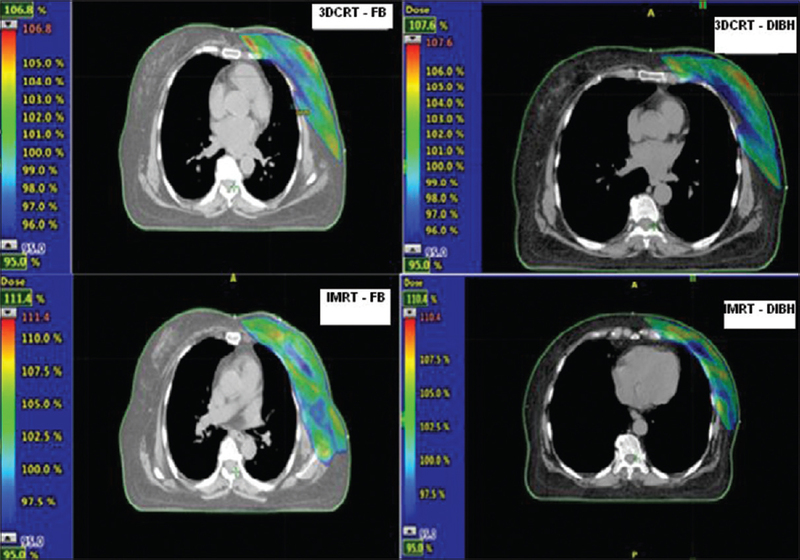 Modern treatment techniques such as computed tomography (CT) simulation and conformal techniques of radiotherapy reduce the cardiac dose by decreasing the coverage of target volumes or large volumes of heart receiving low dose radiation. This low-dose tissue bath can result in detrimental effects. Thus, it is appropriate to minimize the cardiac dose to the least possible. In this study, heart doses are compared between three-dimensional radiotherapy (3DCRT) and intensity modulated radiotherapy (IMRT) techniques with and without DIBH. This was a single institutional prospective study conducted between June 2014 and April 2016. In this study, 15 newly diagnosed patients with left side breast cancer with no breathing difficulty treated with adjuvant EBRT were recruited. All patients provided informed consent for the proposed treatment. Clearance from the institutional ethical board and scientific committee board was obtained. Patients were immobilized in supine position using angled breast board with 10–15° inclination, with both arms abducted above shoulder and head turned to contralateral side. Post-operative surgical scars, medial and lateral borders were marked with thin radio-opaque wire. Patients were coached about the breath hold acquisition technique. Breath-hold amplitude was monitored using Varian Real time Position Management (RPM) system (Varian Medical Systems, Palo Alto, CA, USA). This system uses a perspex box with infrared markers as an external surrogate which is tracked by an infrared camera situated at the end of the CT couch. The marker was placed on the midline anterior abdominal wall at the level of the diaphragm outside the treatment area. The breath hold was analyzed on RPM monitor, and upper and lower gate thresholds were adjusted ensuring the maximum acceptable movement within these thresholds was 5 mm. Once the patient was comfortable, FB and DIBH planning CT scans of 5 mm slice thickness were acquired. Clinical target volume (CTV) for the breast/chest wall and nodal regions were delineated on both FB and DIBH scans according to Radiation Therapy Oncology Group breast cancer Atlas More Details. The chest wall CTV was expanded 5 mm to create chest wall planning target volume (PTV), keeping anterior and posterior borders unchanged to account for build-up region, and to spare the underlying normal lung from high dose radiation. The breast CTV was expanded to breast PTV and it was cropped 3 mm anteriorly from skin to minimize high-dose levels in the build-up regions for IMRT plans. The organs at risk (OARs) such as heart, LAD, left lung, contralateral breast and spinal cord were contoured on both FB and DIBH scans. Heart contouring was done using Feng et al. cardiac atlas. LAD was contoured and planning organ at risk volume (PRV) margin of 3 mm was added to account for uncertainties of motion and respiration. Planning was performed using the Varian Eclipse™ Treatment Planning System Version 8.9 (Varian Medical Systems, Palo Alto, CA) using anisotropic analytical algorithm. The prescription dose was 50 Gy in 25 fractions at 2 Gy per fraction. Both 3DCRT and IMRT plans were generated on both FB and DIBH data sets, thus creating 4 plans (3DCRTFB, 3DCRTDIBH, IMRTFB and IMRTDIBH). The dose rate for 3DCRT was 600 monitoring units (MU)/min and for IMRT 400 MU/min. In this technique, the mono-isocentric irradiation with opposing tangential photon fields for breast/chest wall and anterior portal for supraclavicular region with 6 MV energy was used. The isocenter was set at the junction of supraclavicular and tangential fields. To avoid the divergence of tangential fields into lung, half beam blocks were created with asymmetric collimator jaws. Using digitally reconstructed radiograph images, gantry angle was determined to ensure adequate coverage of the target volume along with the least volumes of lungs, heart, and contralateral breast within the treatment field. Critical organs were shielded using multileaf collimators (MLC) without compromising PTV coverage. Opposing lateral tangential field was created. Homogeneous dose distribution was obtained by field-in-field technique and by adjusting field weights. The supraclavicular field was angled at 340–345° to protect the spinal cord and the esophagus. Two different dose normalization points were used in this three-field technique. IMRT plans included six beams with fixed jaws, using dynamic MLCs, starting from 320° and equally spaced every 40° to cover breast/chest wall (320°, 0°, 40°, 80°, 120°, and 160°). Beams were coplanar with the collimator angle set to 0°. Beams and angles were kept the same for all patients for uniform comparison. Treatment plans were designed so as to cover the PTV by at least 95% of the prescribed isodose and meet the OARs dose constraints. No MU constraint was used to allow sparing of OARs. In this study, a total of 60 plans (4 sets - 3DCRTFB, 3DCRTDIBH, IMRTFB, and IMRTDIBH) were generated and evaluated. Dosimetric parameters were compared between the sets of plans. Dose-volume histogram (DVH) parameters were compared between plans for each FB and DIBH scan with 3DCRT and IMRT based on OAR doses: mean dose to heart (HeartDmean), volume of heart receiving 5 Gy, 10 Gy, 20 Gy, and 25 Gy (Heart V5, Heart V10, Heart V20, Heart V25, respectively), mean and maximum dose to LAD (LADDmean and LADDmax, respectively), mean and maximum dose to LAD PRV (PRV LADDmean and PRV LADDmax, respectively), mean dose to ipsilateral lung (LungDmean), volume of ipsilateral lung receiving 10 Gy and 20 Gy (Lung V10 and Lung V20, respectively), and mean dose to contralateral breast (Contra BreastDmean). The mean dose to PTV (PTVDmean), Conformity Index (CI) and Homogeneity Index (HI) were reported and compared. CI = Volume of PTV covered by the 95% isodose curve/Volume of PTV. (CI of 1.0 is ideal). (HI of zero is ideal); where, D2%, D98%, D50% are doses received by 2%, 98%, 50% of volume, respectively. Continuous variables are presented as a mean and standard deviation. The comparisons between the groups were performed using two-tailed pairwise Wilcoxon signed rank tests. All statistical computations were carried out using Statistical Package for the Social Sciences version 20.0 (SPSS version 20, SPSS Inc., Chicago, IL, USA). The value of P < 0.05 was considered to indicate statistically significant difference. The comparison of target coverage and doses to OARs between the plans are summarized in [Table 1] and [Table 2]. The comparison of dose distribution and DVH between four plans generated for a single patient are shown in [Figure 1] and [Figure 2]. There are studies reporting the cardiac sparing benefits of IMRT over 3DCRT and DIBH over FB in 3DCRT. There are few studies comparing FB and DIBH techniques when incorporated in IMRT and 3DCRT to evaluate cardiac and LAD-CA doses. The results in two such studies, evaluating 3DCRT and IMRT with and without DIBH showed contradictory results., The current study is another attempt to explore further on this issue on whether the use of IMRT resulted in an additional decrease of the cardiac dose as well as a further decrease in the dose to LAD-CA, in cases with and without the use of DIBH. Radiation-induced cardiac toxicity depends on the dose and volume of cardiac exposure. Quantitative Analyses of Normal Tissue Effects in the Clinic suggests the Heart V25 to be <10% to decrease the cardiac mortality to <1%. It is achieved in the current study with all the four plans. In the present study, cardiac dose reduction with DIBH was evaluated and compared between 3DCRT and IMRT. 3DCRT was found to be a simpler method than inverse IMRT to provide a homogeneous dose distribution and lower doses to OARs. With DIBH, we found a statistically significant reduction in all dose-volume parameters specified for the heart, with maximal sparing with 3DCRTDIBH amongst all 4 plans (3DCRTDIBH, IMRTDIBH, 3DCRTFB and IMRTFB). IMRT significantly increased the low dose cardiac tissue bath (Heart V5) by 90% compared to 3DCRT irrespective of breathing technique. Heart V20 and Heart V25 were not significantly different between IMRT and 3DCRT, whether delivered by DIBH or FB techniques. In a systematic review by Latty et al., the reduction in HeartDmean ranged from 26% to 75% in 3DCRTDIBH and IMRTDIBH. In our study, DIBH technique reduced the HeartDmean by 53.5% in 3DCRT plans and by 14.5% in IMRT plans compared to FB technique. Using DIBH, 3DCRT reduced HeartDmean by 67.6% over IMRT. In 3DCRTDIBH there was a reduction in the LADDmean by 28.5% compared with 3DCRTFB. IMRTFB and IMRTDIBH further lowered the LADDmean by 30% and LADDmax by 18% compared with 3DCRTDIBH. This was because of the proximity of the LAD to the target volume, resulting in higher doses even with 3DCRTDIBH plans. In a systematic review by Smyth et al., the cardiac dose sparing benefits of DIBH are reported with 3DCRT and IMRT. With DIBH, the reduction in HeartDmean ranged from 38% to 67% and the reduction in LADDmean ranged from 31%-71%. Our results are consistent with their findings. Furthermore, our study has shown the dosimetric superiority of 3DCRTDIBH over rest of the 3 techniques (3DCRTFB, IMRTFB and IMRTDIBH) in terms of better sparing of heart, lung as well as the contralateral breast. However, we observed the lowest LAD doses with IMRTDIBH. In a study by Trifiletti et al., 3DCRTDIBH produced maximal sparing of heart compared with IMRT. In another similar study by Bolukbasi et al., 3DCRTDIBH better spared the heart, LAD and contralateral breast compared to inverse IMRT. Our results are consistent with these studies, with regards to heart, left lung and contralateral breast. However, IMRT further lowered the LADDmean dose compared to 3DCRTDIBH. In the current study, all dose-volume parameters of the lung were lowest with 3DCRTDIBH over rest of the three plans. The reduction in LungDmean was 16% with 3DCRTDIBH compared with 3DCRTFB, and 5% with IMRTDIBH compared with IMRTFB. IMRTDIBH significantly increased the LungDmean and Lung V20 by 27% and 23.6% respectively over 3DCRTDIBH, again showing the dosimetric superiority of 3DCRTDIBH over rest of the three plans. The risk of late second malignancies is a concern when IMRT is used, as a result of increased healthy tissue being exposed to higher doses and increased MUs delivered. One such example of second malignancy is contralateral breast cancer which may develop years later after the irradiation. In the current study, IMRT plans increased the Contralateral BreastDmean by 91% over 3DCRT, irrespective of breathing techniques. 3DCRTDIBH technique in our study resulted in significantly higher delivery of MUs than in 3DCRTFB. Breathing techniques chosen made no significant difference in MUs in IMRT plans. However, 3DCRT fared better in this regard than IMRT when delivered with DIBH technique. Although IMRT delivered more conformal plans, it is at the potential increased risk of second malignancies by virtue of delivering higher MUs. This issue is all the more important when women of age <40 years are delivered IMRT. Thus, in our study, we found the dosimetric superiority of 3DCRTDIBH over rest of the plans with regard to better sparing of OARs and with adequate target volume coverage. Hence, we conclude that 3DCRTDIBH is the preferred technique for left-sided breast cancer irradiation. Studies are required to report the long-term clinical outcomes of DIBH technique in left breast irradiation, as all the present studies are dosimetric. Studies reporting cardiac dose-volume responses to radiation are also required, to assess the cardiac dose to be minimized. There are some limitations of the current study. First, the sample size of this study was relatively small. Second, this study involves dose measured from the TPS. However, any independent dose verification using phantom study would have given more accurate dose measurement. Third, in-vivo dose verification of the contralateral breast was not done due to in availability of in vivo dosimeters at our institute. 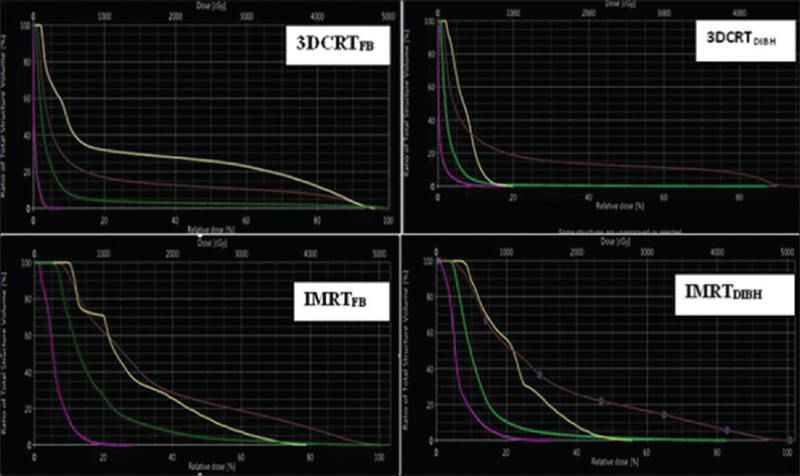 Both 3DCRT and IMRT have shown optimum target coverage with a superior CI and HI with IMRT plans. However, the 3DCRTDIBH plan has been shown to spare all the OARs, especially heart to the maximum extent compared with rest of the plans as the IMRT plans (both IMRTDIBH and IMRTFB) contribute higher integral doses to the ipsilateral lung and contralateral breast. We would like to thank Dr. Anjali Kakria, MD (Consultant Radiation Oncologist) for her help in this work. Remouchamps V, Letts N, Vinvini F, Sharpe M, Kestin L, Chen P, et al. Initial clinical experience with moderate deep-inspiration breath hold using an active breathing control device in the treatment of patients with left-sided breast cancer using external beam radiation therapy. Int J Radiat Oncol Biol Phys 2003;56:704-15. Korreman SS, Pedersen AN, Aarup LR, Nøttrup TJ, Specht L, Nyström H. Reduction of cardiac and pulmonary complication probabilities after breathing adapted radiotherapy for breast cancer. Int J Radiat Oncol Biol Phys 2006;65:1375-80. Lu HM, Cash E, Chen MH, Chin L, Manning WJ, Harris J, et al. Reduction of cardiac volume in left-breast treatment fields by respiratory maneuvers: A CT study. Int J Radiat Oncol Biol Phys 2000;47:895-904. Sixel KE, Aznar MC, Ung YC. Deep inspiration breath hold to reduce irradiated heart volume in breast cancer patients. Int J Radiat Oncol Biol Phys 2001;49:199-204. Remouchamps VM, Vicini FA, Sharpe MB, Kestin LL, Martinez AA, Wong JW. Significant reductions in heart and lung doses using deep inspiration breath hold with active breathing control and intensity-modulated radiation therapy for patients treated with locoregional breast irradiation. Int J Radiat Oncol Biol Phys 2003;55:392-406. Stranzl H, Zurl B. Postoperative irradiation of left-sided breast cancer patients and cardiac toxicity. Does deep inspiration breath-hold (DIBH) technique protect the heart? Strahlenther Onkol 2008;184:354-8. Vikström J, Hjelstuen MH, Mjaaland I, Dybvik KI. Cardiac and pulmonary dose reduction for tangentially irradiated breast cancer, utilizing deep inspiration breath-hold with audio-visual guidance, without compromising target coverage. Acta Oncol 2011;50:42-50. Feng M, Moran JM, Koelling T, Chughtai A, Chan JL, Freedman L, et al. Development and validation of a heart atlas to study cardiac exposure to radiation following treatment for breast cancer. Int J Radiat Oncol Biol Phys 2011;79:10-8. The International Commission on Radiation Units and Measurements. Journal of the ICRU 2010;10:5.2-6. Trifiletti DM, Wijesooriya K, Moyer G, Lain D, Geesey C, Forbes K, et al. Intensity-modulated radiotherapy versus three-dimensional conformal radiotherapy during deep inspiratory breath hold for left-sided whole-breast irradiation: A comparative analysis. J Radiother Pract 2016;15:99-106. Mast ME, van Kempen-Harteveld L, Heijenbrok MW, Kalidien Y, Rozema H, Jansen WP, et al. Left-sided breast cancer radiotherapy with and without breath-hold: Does IMRT reduce the cardiac dose even further? Radiother Oncol 2013;108:248-53. Latty D, Stuart KE, Wang W, Ahern V. Review of deep inspiration breath-hold techniques for the treatment of breast cancer. J Med Radiat Sci 2015;62:74-81. Smyth LM, Knight KA, Aarons YK, Wasiak J. The cardiac dose-sparing benefits of deep inspiration breath-hold in left breast irradiation: A systematic review. J Med Radiat Sci 2015;62:66-73. Bolukbasi Y, Saglam Y, Selek U, Topkan E, Kataria A, Unal Z, et al. Reproducible deep-inspiration breath-hold irradiation with forward intensity-modulated radiotherapy for left-sided breast cancer significantly reduces cardiac radiation exposure compared to inverse intensity-modulated radiotherapy. Tumori 2014;100:169-78.